*fair note, I put additional bold formatting beyond the sent copy to highlight features of interest. 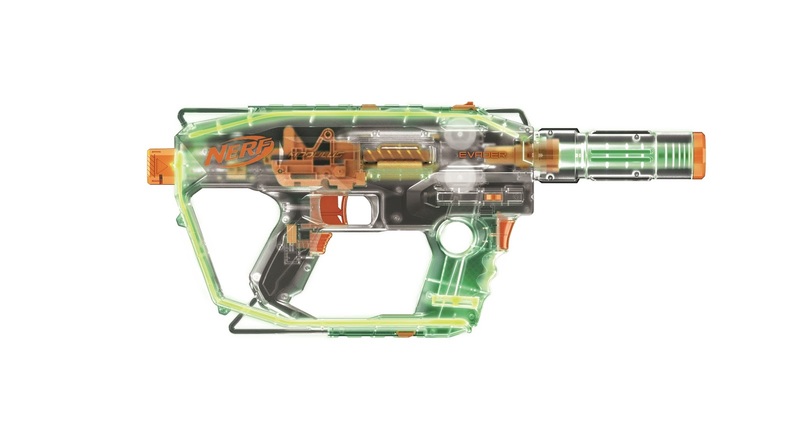 Experience intense head-to-head competition with the NERF RIVAL HADES XVIII-6000 blaster! Load 60 high-impact rounds into the easy-load integrated magazine, prime, and pull the trigger to fire a barrage at your enemies. Whether Team Red, Team Blue, or Phantom Corps, Rival battles will never be the same. Package includes blaster, 60 high-impact rounds, two flags and instructions. Available at most major toy retailers nationwide and on HasbroToyShop.com. 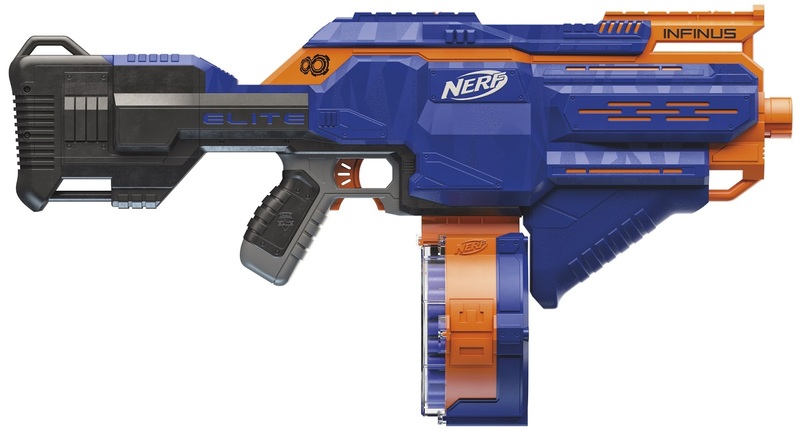 Load and fire fast with the NERF N-STRIKE ELITE INFINUS blaster! The INFINUS blaster features motorized Quick-Load Technology; as kids feed darts into the blaster, the darts are automatically loaded into the 30-dart removable drum. With motorized, rapid-fire blasting, kids can quickly unleash a barrage of darts on their targets. Hold down the acceleration button to power up the blaster, then pull the trigger to fire. 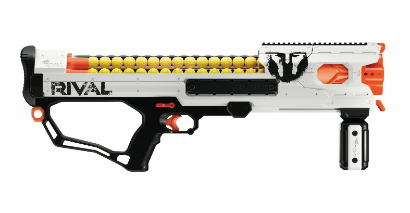 The INFINUS blaster includes 30 Elite darts. Requires 4 D batteries, not included. Available at most major toy retailers nationwide and on HasbroToyShop.com. Stay in stealth mode or light the way with the NERF MODULUS GHOST OPS EVADER blaster! Part of the GHOST OPS series, the MODULUS EVADER is completely clear to keep players undetected on any mission. Illuminate the blaster to guide the way in low-light situations by pressing the light activator. Customize the blaster with the barrel extension which lights up when attached to the blaster. Load the 12-dart clip into the Evader blaster, take aim, and unleash 12 darts in a row with rapid-fire motorized blasting. Enemies will never see you coming! Package includes blaster, clip housing cover, barrel extension, 12-dart clip 12 darts, and instructions. Requires 4 “AA” alkaline batteries (demo batteries included). Available at most major toy retailers nationwide and on HasbroToyShop.com. Zombie survivors are prepared for anything with the NERF ZOMBIE STRIKE SURVIVAL SYSTEM SCRAVENGER blaster! This essential zombie defense kit keeps battlers ready for any zombifying challenge that comes their way. Load a 12-dart clip into the SCRAVENGER and unleash a dozen darts in a row. Grab the extra clip from the holder and slam-fire the zombies away with the on/off slam-fire button, or stabilize shots with the stock/blaster attachment to never miss a target. The 2-dart back-up blaster allows battlers to surprise oncoming zombies who will never see it coming. Package includes blaster, stock with blaster, scope, tactical light, barrel extension, two 12-dart clips, 26 ZOMBIE STRIKE ELITE darts, and instructions. Available at most major toy retailers nationwide and on HasbroToyShop.com. 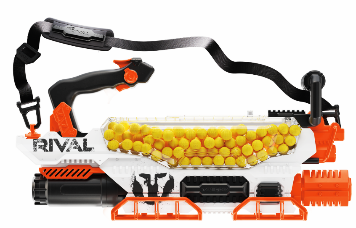 Head into battle blazing to take on the competition with the NERF RIVAL PROMETHEUS MXVIII-20K blaster! This blaster features the new ADVANCED ACCELERATION SYSTEM which allows it to fire at a rate of 8 high-impact rounds per second! This blaster also holds a whopping 200 high-impact rounds in its easy-load hopper. The PROMETHEUS MXVIII-20K blaster is fully motorized with a rechargeable NiMh battery for endless fun. Package includes blaster, 200 high-impact rounds, rechargeable NiMh battery, charger, two flags, shoulder strap and instructions. Available at most major toy retailers nationwide and on HasbroToyShop.com. Introducing Nerf’s first ever MEGA ACCUSTRIKE blaster! Blast with power and precision with the NERF MEGA THUNDERHAWK blaster. The barrel extension slides back and forth on the top of the blaster for custom performance allowing for distance targeting or a more compact blaster. The THUNDERHAWK allows for steady shots with the flip-down bipod for MEGA performance with ACCUSTRIKE accuracy. The THUNDERHAWK blaster includes a 10-dart, side-loading indexing clip and 10 NERF MEGA ACCUSTRIKE darts. Also compatible with NERF MEGA darts. Available at most major toy retailers nationwide and on HasbroToyShop.com. Ultimately, Nerf once again is going for premium pricing for their higher visibility blasters. The addition of Accustrike Mega Darts, a faster firing rate from the Prometheus, Quick-load technology, and a slam-fire on/off switch… those are some interesting features for this year. New York Toy Fair will be something else, for sure this year. There will undoubtedly be the smaller range items that have a soft release over the course of the year, so don’t be surprised to see additional blasters release as the year continues. But that’s a thought for another day. Thanks for reading, and make sure to watch for new edits and blog posts as the days to Toy Fair continue to pass!